Most of us take our ability to breathe effortlessly for granted. But those of us that suffer with the sinuses, well what can I say, it’s pretty appalling. Headache, pain in the face, stuffed or runny nose, post nasal drip, sneezing, awful taste in the mouth, dizziness, upset stomach are only some of the symptoms of a sinus condition. So out comes the neurofen, the paracetamol, the nasal spray, the decongestants and many more over the counter products in the hope that they work immediately and allow you to continue your day in better form. If they don’t then it’s off to the Dr;s for an antibiotic. But, by this time perhaps a week has passed or more which has allowed the problem to go deeper into the body presenting itself perhaps as a chest infection aswell. Most cases presenting to an acupuncturist have been down this route time and time again. Interestingly, after receiving acupuncture for their sinuses they then opt for acupuncture as their first treatment preference. Why? Apart from the fact that it works, acupuncturists look for the cause, for the weakness or disharmony in the body that has allowed this to happen in the first place. If we look at what happens anatomically we can better understand not just sinusitis but the terminology and system used by the Chinese to describe and therefore treat this condition. Sinusitis is simply an inflammation of the mucous membranes that line the sinus cavities. Acute or chronic inflammation causes the mucous membranes to secrete more mucous, sometimes to the point where the tissues in the nasal cavities can become swollen. This can then prevent drainage. So the nose becomes congested, you can loose your sense of smell (anosmia) and pain can develop in the face and head area. 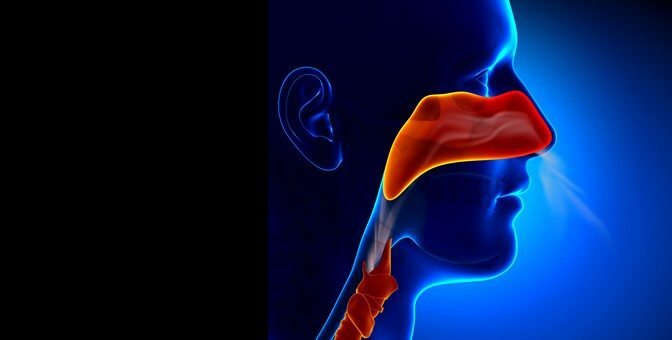 The drainage route can then move to the back of the nose to get a post nasal drip, a cough, sore throat and yellow or green production of mucous. Acute sinusitis is usually due to a secondary bacterial infection following a prior viral chest infection or an allergic type reaction in the nasal area from the environment, better known as allergic rhinitis. Chronic sinusitis may have no signs of acute infection but over a period of weeks and months the signs include pain in the face, neck or head, loss of appetite, a cough that is usually worse at night with daytime fatigue or a general sense of malaise. A primary cause of chronic sinusitis is the fact that an acute sinusitis was treated ineffectively, which then leads to further attacks. Other causes are overuse of decongestant nasal sprays, smoking, swimming, diving, allergies, or as the Chinese say an underlying disharmony within the body that presents itself as sinusitis. The pattern of disharmony identified by your acupuncturist can be varied and different to say your friend that also has the same problem. But that is the uniqueness of the Chinese perspective. For instance, overeating fats, hot spicy foods, sweets, or drinking alcohol, can engender or create what we say is ‘damp’ and ‘heat’ in the body. Damp then congeals or thickens to form phlegm while heat moves upwards (a bit like steam) and lodges in the orifices of the lungs, which include the nasal cavities. This damp and heat can be attributed to a weakness in the spleen energy system. But, how does a weakness in this spleen system develop? The spleen is nourished via the stomach, and as we know we eat to derive nourishment for the body overall. So eating or drinking excessively, irregularly and unhealthily damages this spleen energy. This reflects the Chinese thinking of yin and yang, of paired organs. The stomach is considered yin and paired with the spleen, its yang partner. In addition, the emotional aspect affects the spleen. Worry being the biggest factor. This is part of stress. Is there anyone that is not or never worried about something? Can you see how long-term worry affects you? Now if the spleen energy can be harmed, then this can affect the stomach energy or yin. Can you see then how stomach disorders can start and how the complexity of disharmonies arise within this system of thinking? Apart from the spleen, heat that is considered latent or depressed in the liver system from emotional stress or frustration can also contribute towards developing sinusitis, particularly of a repetitive variety, or as western medicine describes it, chronic sinusitis. The above patterns of disharmony all involve ‘heat’, but sinusitis can also be due to ‘cold’ or to be more precise ‘empty cold’. The expression empty means it is a deficiency or weakness. This cold lodges in the body and interferes with the function of transforming and transporting fluids in the body. These fluids gather and transform into ‘damp’, which can congeal into phlegm if there long enough. Again this is associated with a weakness in the spleen energy system. Now the Chinese say, that the spleen is the mother of the lungs, so if the spleen is weak then the child, the lung, is weak. So if the function of the lung is to inspire and expire and there is fluid or phlegm impairing its downbearing function then these fluids accumulate and spill over into the nasal orifices. This results in a clear watery nasal discharge, nasal congestion, lethargy, loss of appetite, malaise and general lack of strength. Is there anyone that has not had this variety of what was assumed to be a bit of a cold? A runny nose with no appetite or strength but over a few days or weeks the nasal discharge went but you were left feeling wrecked? But perhaps what you didn’t know was, it was a sinusitis of the damp empty cold variety, and as the Chinese say, damp always turns to heat, as does cold. So, sinusitis can develop from a variety of sources in Chinese medicine, but from a western perspective it is, bacterial, a chronic inflammation or environmental. It does not consider how fluids or heat act, or the present state of the body internally as a complete system with this condition unless of course it is your adenoids. If it is appropriate, these are then removed. Acupuncturists think differently, we look for a root cause and treat the root along with the presenting signs and symptoms. We also consider how one system affects the functioning of another, short term and long term. Ultimately, the intricacies of this system can help prevent long-term illnesses developing. So don’t wait for the loss of appetite, the anosmia, the dizziness, the chronic condition, treat a sinus issue early, before it goes deeper and affects the body. And, if you do have an underlying disharmony, well, this will be treated too.